The race is still on… Jerick of 25 Travels passed me the baton on Sunday and it is my turn to sprint. Here I go! Neil Barnes of Backpacks and Bunkbeds organized our team and was able to recruit some pretty radical travelers! So far their stories have inspired me to continue to travel, hopefully you can make time to read through them. Picking up our car was our first adventure. Americans tend to drive automatics and rarely learn to drive a manual transmission. 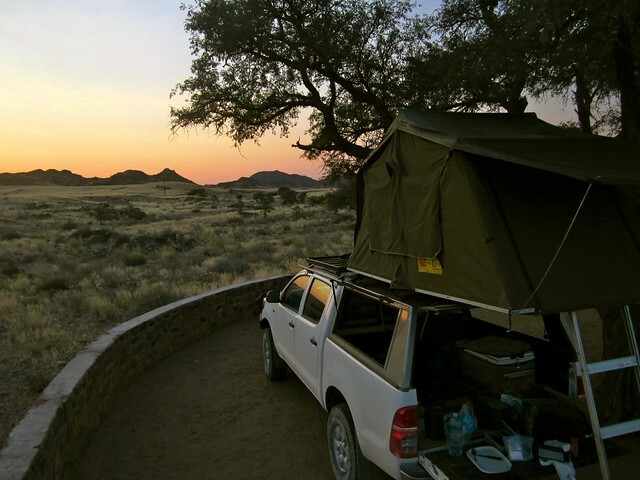 So imagine our excitement when the huge 4×4 truck with our tent on the top is a manual and they start giving us tips on driving through sand, on gravel roads and around wild animals. Give us a second, we need to master the art of stopping and going first. Since we had a map of Botswana and a small blue compass purchased in Bangkok the week earlier we opted to skip the GPS for our car. Whether this was a good decision or not is up for debate but it definitely made the trip more exciting! We crawled through the 1.5m of sand on the 55km “sand ridge” road. We quickly learned how to reverse when you have a ornery papa elephant charging at you, and we became experts at cooking over a fire. Driving ourselves meant we were on our own. The feeling of safety because you had a guide that understood the animal’s reactions and movements was forfeited when we opted to set up our own camp and guide ourselves. We had to make the decision to eat dinner in our car because the elephants walking through our camp were bothered by our presence and we had to determine how close was too close when you were approaching territorial hippos on the Chobe River. Every moment was filled with uncertainty and excitement. My heart has never beat faster during these three weeks while we found ourselves in terrifying situations with the wild. Mostly terrifying because we had no idea what to do, we figured it out along the way – still not sure if our decisions were the best, but we made it through! At the end of the day, after all of the stressful decisions were done we would sit in our fold up chairs with a glass of wine or beer and look up. The sky in Botswana is unlike any sky I have ever seen. The blue during the day is so blue and the stars at night are shining bright. Hundreds of millions of stars scatter the sky with no end in sight. There are no big city lights or sky scrapers to obstruct the view, just our small fire keeping us warm. This trip wasn’t a relaxing day at the beach but it was an unforgettable trip that by far ranks as our best travel experience ever! My head is still groggy after my 5 AM alarm goes off. I fumble around with my contacts, attempt to brush my teeth and meet up with the other 2 guys in the group. Today we are running with a herd of bulls. 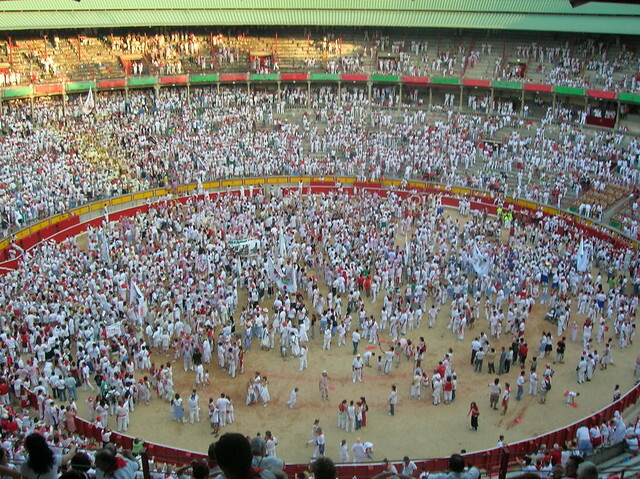 We climbed in the narrow streets of Pamplona with the other thousands that are up early (or never went to sleep) in search of one of the biggest adrenaline rushes I have ever experienced. We begin to look around and saw a bunch of disheveled people. Red eyes, dark circles and some still with beers in their hands. “Did anyone on the street actually sleep last night?” we asked ourselves. We couldn’t talk, in true Spanish style we had only gotten about 4 hours of sleep and of course had a few cervezas and vinos the night before. I have seen the newspaper photos of gored runners and I quickly could understand why. We distanced ourselves from those flailing their red clothing items around in true taunting fashion and prepared to run. The rocket went off and our feet started moving. At first you heard only footsteps until the bulls caught up with us. Their hooves clanged on the stone walkways and as the sound grew closer I began searching for an easy exit. I didn’t want to get stuck without a fence or on a tight turn with only me and Mr. Bull. As I am running and strategizing in my own head I see a guy in front of me leap between the fence at the final turn like he had just run across flaming hot coals and I instinctively followed. Quickly whipping my head around I saw a bull’s backside just pass as I grasped the fence for dear life. I had run with the bulls and am alive to tell about it. We spent 4 hours in a pool. A pool where I could quickly surface if anything went wrong and no predators were circling me. After 4 hours of safety videos and learning a few skills underwater we jumped on a boat and headed out to the open sea. We did our checklist for our oxygen tank and double checked that everything was strapped on, tucked in and secured properly. Pulled on our fins, pulled down our masks and fell backwards off the boat into the water giving our instructor the signal that we were ok.
As we let out the air from our vests we descended into the deep, swallowing hard with every little bit to ensure our ears were clear. Finally we reached the sea floor, an area that humans technically shouldn’t be. We had entered a world that functions and survives without an economic system and defies the rules of gravity. We float through the water, attempting to move our bodies as little as possible and exert as little energy as we can. It is a surreal moment when you realize you are breathing under water, floating past schools of fish, beautifully colorful coral and OH CRAP A SHARK! A shark that glides away when you are near. He is as big as you are and you realize that you are in his world and he wants nothing to do with an awkward group of humans floating in black wetsuits. So you float on…marveling in the moment that you defied gravity. I hope you enjoyed my top three travel adventures, next up, I’m passing the baton to Greg at Adventures of a Goodman. Can’t wait to read it! Love it – mostly because I wish I got my scuba certification in the Gili islands! I went snorkelling there and found myself face-to-face with a giant sea turtle, which made me want to get certified all the more. The water there was so clear and warm. So much to see!